Dozens of jurists send letter of support to Interior Minister, telling him to stand firm on illegal migrants. Dozens of jurists sent a letter of support to Interior Minister Gideon Saar Thursday, telling him to stand firm in the face of pressure not to expel illegal migrants from Israel. Sheftel estimated that the infiltrators will all be repatriated in five years' time, and “we can get rid of this rabble.”. The leftist provocateurs “went to the places where these people concentrated in Egypt and told them that they should come to Israel,” he added. Middle East expert Dr. Guy Bechor wrote last year that leftist "human rights" NGOs seek to change Israel's demographic balance. "After they failed to let in hundreds of thousands of Palestinians into this country, these people now expect a migration of hundreds of thousands of Muslims from Africa to Israel. It’s not a war on immigration that lies ahead of us, but a war over the continuation of the Jewish majority in Israel," he states bluntly. At about the same time that Bechor penned the article, the Elder of Zion blog cited a monograph written by a man named Yonathan Paz that was published by UNHCR. In it, Paz quotes an unnamed NGO worker who "argued that civil society organizations [the name by which ultraleftist NGOs call themselves -- ed.] advocate a perception of 'universalistic citizenship‘, where everyone should have rights. 'They do not see the nationality issue as relevant, but publicly, it is not stated. In today‘s public atmosphere, we will not say it out loud because it does not serve the struggle and the strategy.' As the same NGO worker argued: 'The central issue here is [one that addresses] the nature of Israeli civil society, the struggle is about the character of Israel as a state, and the refugees are not really sharing this struggle, they are rather disempowered by it.'" 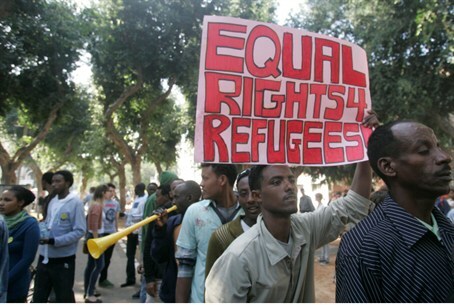 In addition, a participant at nationalist website rotter.net translated an interview with a Sudanese man who crossed into Israel, which appeared three years ago in a Sudanese news publication. While the man's testimony regarding his entry into Israel and his stay seems to mix some fantasy in with facts, he does name two leftists that he says worked with him. One is Anat Ben Dor, who is a member of the Legal Clinic for Refugees in Tel Aviv University, which has been fighting to allow the African infiltrators into Israel and to prevent their arrest and deportation. The legal clinics at TAU are run by Neta Ziv, who was a longstanding official in the New Israel Fund.